The United States has put aside political differences to send help to the earthquake-hit area of Iran. It joins a list of nations from Britain to China who are contributing teams or resources to help victims. 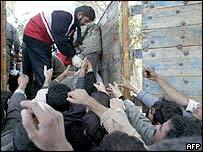 President Mohammad Khatami appealed for assistance, saying the devastation was too great for Iran to handle by itself. Some rescue teams have reached the south-eastern city of Bam, but hopes are fading that they will be able to find many more survivors in the rubble. In Washington, the Bush administration made a rare direct contact with Iranian officials to offer assistance. Deputy Secretary of State Richard Armitage and Iran's permanent representative to the United Nations, Mohammad Javad Zarif, held telephone talks about humanitarian aid. "Given the urgency of the situation we deemed direct contact to be the most appropriate channel," state department spokesman Lou Fintor said. The White House said teams of 200 civilian experts would be sent to Iran, once described as part of an "axis of evil" by US President George W Bush. Two US planes carrying food and other aid landed in Kerman, the provincial capital, early on Sunday - the first US aircraft to land in Iran for a decade. 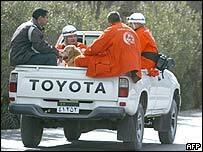 But a disaster response team heading out from Los Angeles was earlier put back on standby after a request from Tehran. A plane carrying emergency workers from Virginia had to turn back after mechanical problems, the Associated Press news agency reported. Aid teams from Europe were among the first to arrive in Iran in the crucial first hours after the earthquake. Rescue specialist Willie McMartin, of the International Rescue Corps, said about 90% of all casualties were recovered in the first 24 hours. "We then go in to look for the people who are sub-surface, they're deeply trapped within the structures... that's where the specialists come in." Roland Schlachter, the leader of a 10-person Swiss team that arrived in Bam early on Saturday, said the chances of turning up survivors was slim. "It has to do with the way the houses were built and have collapsed. There appears to be very few air spaces created when the buildings collapsed," he told German television. He went on that help was also needed for the thousands who survived the earthquake but were left homeless in freezing overnight temperatures. "The people are practically standing naked to the cold on the streets because they've lost everything they had." According to Iran's state media, no rescue teams have been able to go to the small towns and villages around Bam. A health official from Kerman Province, Dr Mohammad Setayesh, told the Iranian Mehr news agency that most of the search operations in hard-to-reach areas are being carried out by relatives who have come from other cities. "They do the job by using tools such as shovels and pickaxes," he said. "They haven't given up hope of finding people alive in the face of overwhelming losses"